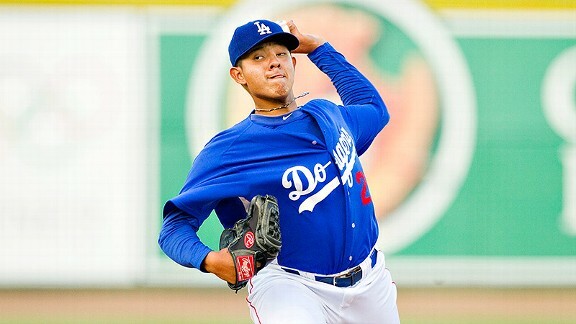 Daily Distractions: Julio Urias gets his Mexican food, and Dodgers fans in Rancho Cucamonga get their prospects. This is a rough map of all the Mexican restaurants in Rancho Cucamonga. On March 15, after he pitched a scoreless inning against the San Diego Padres — something Brian Wilson couldn’t do last night — Urias still didn’t know where he would begin the regular season. At least the Dodgers’ prized pitching prospect had no trouble identifying the hardest part of being uprooted to the United States at 16. Fortunately for Urias, now 17, there are many options in the neighborhood of the Dodgers’ Single-A affiliate in the California League. As we reported yesterday, Urias will be assigned to Rancho along with 2013 first-round draft picks Chris Anderson and Tom Windle, along with Corey Seager, the Dodgers’ first-round pick in 2012. In case you’re counting at home, that’s four of the club’s top 10 prospects (per MLB.com) playing in one spot, about an hour east of Los Angeles. Urias, Anderson and Windle all finished last season with Class-A Great Lakes, and each saw action in one Cactus League game. The Dodgers drafted Anderson and Windle in the first and second rounds of the 2013 draft, respectively, out of college. Urias was signed as a free agent out of Culiacan, Mexico. Pitcher Zach Lee and outfielder Joc Pederson will begin the season with Triple-A Albuquerque. So will Matt Magill and possibly Onelki Garcia once he’s healthy. • Tony Gwynn Jr.’s last Opening Day start was in 2011 for the Dodgers — before today. • ICYMI: Remember Jonathan Denver, the Dodgers fan who was fatally stabbed by a Giants fan after a game in San Francisco last September? His killer will not face charges. • Since it’s Opening Day for everyone else, here are baseball’s Opening Day records, courtesy of SBNation.com. Hanley Ramirez holds an Opening Day record. • Jerry Reuss wrote a book. • The strike zone is getting bigger. • This was fun: If you want to save money on your next marriage proposal at a Major League Baseball stadium, go to Pittsburgh. And don’t go to Anaheim. This entry was posted in Daily Distractions, JP on the Dodgers, On The Farm and tagged Chris Anderson, Corey Seager, Hanley Ramirez, Joc Pederson, Julio Urias, Matt Magill, Onelki Garcia, Tom Windle, Tony Gwynn Jr., Zach Lee by J.P. Hoornstra. Bookmark the permalink.